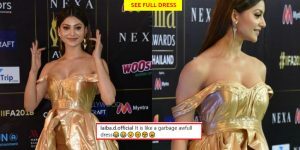 Urvashi Rautela is one of those who is famous for her style and outfits, in the past, she has shown some classy dresses, and people loved it very much. However, whether you call it to experiment or bad choice, people do make mistakes, and she is a human just like us after all. Urvashi was massively trolled for the golden dress that she wore at IIFA 2018. Right from the moment when her pictures got published, her fans expressed their feelings about the dress she was wearing. It was golden color dreams, and not many liked it. Which gave a fantastic opportunity for those who keep looking for opportunities to dig on celebrities. While we do not think there was anything wrong with her dress, it’s our preference that what we like or what we do not like. Same as us, it was her choice, and she can wear anything she wants. Model-turned-actress, she has represented India at Miss Universe 2005, she has also worked in Bollywood projects such as ‘Sanam Re,‘ ‘Great Grand Masti‘ and her latest ‘Hate Story 4’. Eager to pursue a career in engineering, the destiny had something better in store for her. Although she has received many fantastic comments as well in the past, she is considered one of the fittest actresses today and a former beauty queen, is extremely disciplined when it comes to a healthy lifestyle, and she has raised the bar of fitness. After she uploads pictures of her fitness, she gets bombarded with fan comments complimenting her fabulous avatar. We think that Urvashi is a fantastic actress and her discipline for her health is inspiring. Her hard work and dedication always amaze us. Her fitness pictures always set fire on social media. She is one of the fittest actresses in Bollywood. We hope to keep receiving amazing posts from her in future and hope for a very bright future for the actress.